I cannot thank you enough for all EXCELL has done for me. Without the program I would not have gotten the interview or been as prepared as I was. I am very grateful for the opportunities and experience that the program has provided….I saw a variety of patients, and at least ten patients at the outpatient clinic. My PA mentor still inspires me to this day and I am so grateful for all he has done for me! The EXCELL Education Pre-Physician Assistant Clerkship changed my life in many ways, and it was an incredible experience I will never forget. I truly believe it was a major factor in my acceptance into Seton Hall. 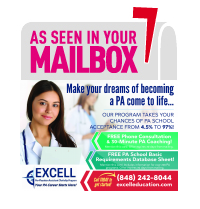 I know I am ready for both PA school and starting my career as a certified physician assistant, and I have EXCELL to thank for that. “The EXCELL Education Pre-Physician Assistant Clerkship strengthened my resolve to become a physician assistant in more ways than one. Before beginning this program, I had only a vague idea of the role a physician assistant has in the field of healthcare. I did not have much experience in patient care, and did not feel prepared to take on the academic rigor of physician assistant schooling. After completing the clerkship, I feel more than qualified to take on the position of a PA. Completing the Quality of Life survey week after week with the same patients built rapport that I could not have gained otherwise. I developed close relationships with many patients and always looked forward to engaging in conversation with them. Nothing is more rewarding than knowing you are the cause of joy in someone’s life, and EXCELL greatly helped me to achieve this. In addition to building patient rapport, becoming a member of a healthcare team and working with professionals to improve patient experience at the facility taught me invaluable leadership skills. It gave me a sense of pride to know that my reports helped to make a positive change in the facility and put dissatisfied patients at ease. My perception of myself certainly changed after completing the EXCELL Clerkship. I feel much more confident in my abilities and almost feel as though I am a physician assistant already. I have had a wide range of patient experiences and feel prepared to take on the role of a healthcare professional. I have the mindset and mentality of a physician assistant, and now all that is left is the proper education and certification to match. “At first I was apprehensive about a tuition-based program because my advisor gave me a lot of other options, but after doing my own research and trying it, I am super satisfied and would do it again regardless of the price tag. The part that i enjoyed the most was the patient contact experience. You gain a lot of knowledge from shadowing, but learning it is different from being able to apply it on your own – you get to work independently and talk to patients, and it’s a really great opportunity to just dive in! I want to actively recommend this to other people – I really want to encourage everyone to look into this option! “It would be hard to pick one thing that prepared me the most for my PA interview because the program as a whole really prepared me – it wasn’t any one thing. But I would say my interaction with patients and shadowing which gave me concrete examples that I can use during my interview to show the admissions committee that I do know more about the PA profession and what it’s like to be part of a healthcare team. A past student told me it was a “Wax On, Wax Off” experience like in the Karate Kid – and it really is! Every part of the program is beneficial. I enjoyed completing the quality of stay surveys and the time I got to spend with the patients – it allowed me to build relationships with them and it was a unique experience because I was able to help the patients – I took the time to listen to them and make them feel important, and I did make a difference in the facility. The mock interviews were helpful because I knew it was something I needed a lot of work in, and I knew I would be very nervous so it definitely helped prepare me in a stressful situation. The critique and video were really helpful because you can definitely see your mistakes and work to improve them. “I found the pre PA program by chance. I asked a physician assistant that I met once his advice about the best type of experiences to get before PA school and how to find those types of experiences. He directed me to this pre PA program and it was the best advice I’d ever gotten. This pre Physician Assistant program is unlike any other out there. I had done some shadowing in hospitals beforehand and while I got to experience being in an operating room, it does not compare to the experience I had with this pre PA program. During my six months of mentorship, I got to do and see so many things I never imagined I’d be able to experience before attending PA school. I not only learned how to take vital signs, but I became extremely comfortable walking into patient’s rooms by myself and interacting with them. I believe this skill will allow me to be much more relaxed when I begin PA school. This program has made me much more confident going into Physician Assistant school, and I would highly recommend it to anyone who is serious about becoming a PA. The EXCELL Pre- PA Program has surpassed my expectations. I felt from the start that if I was serious about attending PA School, a Pre- PA program like this would be essential to my success. I enjoyed the fluid nature of the Pre- PA program. Thanks in large part to the patient setting as well as frequent interaction with the staff, the program works on many levels and was never boring. I especially enjoyed the tension releaser with the Trampoline Park. Not only have I received valuable health-care experience, but EXCELL mentally prepared me for the application process and subsequent interview – I enjoyed it all and patient interaction stood out the most. The EXCELL Pre- PA Program allowed me the opportunity to accumulate personal interactions with patients that I will be able to draw from and discuss in my interviews. In addition, the interview prep helps to align the best experiences and opens it up for critique. EXCELL’s step-by-step approach allowed me to become better acclimated to the interview process while not having to dedicate all of my time to it – the act of improving feels more natural. I am a fan of the EXCELL Pre-PA Program – you guys are great, and the benefits are obvious from so many perspectives. EXCELL helps others grow – Thank you for the opportunity. “Mentoring from EXCELL has given me a priceless resource for endless information. Whether it be trying to get into PA school, being in PA school, or being a PA itself it really just reinforced my dream of wanting to be a PA. The mentoring I received through EXCELL was more than just exceptional, it truly was life changing.